Positivity is contagious … in the good way. If those around you are smiling and in an upbeat mood, it's likely to rub off on you. It's also a learned behavior. The more you're happy and excited in life, the easier it is to repeat that same behavior, oftentimes without even thinking about it. In the same light, negativity can do much of the same. Being around those who are angry or complaining will likely cause more to lower their own mood, even if its only from dealing with their Grumpy Gus of a co-worker. When given the choice, and knowing that either scenario is going to take off no matter which you choose, why go the route that's more miserable? Especially when you can choose a path that allows for happier, more successful folks around you? When they're helping you get work done and bring in new business, it's even further motivation to stay upbeat. To encourage positivity into your everyday working environment, and with those you work with, test out these tried and true methods. You don't have to be over the top about it. (Is anyone else thinking of Alec Baldwin's guest role on Friends where he called the Long Island Expressway "a concrete miracle?") But a few compliments to others can go a long way, especially when just opening a business. If you notice something good taking place, let people know. It's a quick way to give a confidence boost while reinforcing great behavior. Rewards, titles, awards, and more can all serve as an effective way to get employees to work harder and/or better. Keep a points system or hand out prizes for when someone does especially well. Not only will this keep them on their best behavior (they never know when the payout is coming, after all), you can provide instant feedback to a job well done. If your employees don't know what's wrong, they can't fix it. Take the time to set others aside and let them know what type of behavior has been helpful, and what habits need to go. These types of encounters don't need to be anything other than informative. Be honest, quick, and wait to see your franchise's efforts improve. Telling someone "good job" can gain a lot of clout. It will put an instant perk in their step, and let them know the work they're doing is in line with what's wanted and expected. Though it's fast and seemingly second-nature to say, don't underestimate the power of this simple statement. No one wants to work in an environment where it feels like they have zero say. Every so often, take the time to ask workers what they like and don't like about your establishment. Asking, and actually listening to their opinions, can create serious morale. Plus, it can help improve your franchise location for the better. Days off are always nice, as are raises, bonuses, worker parties or holidays, even a regular day of work that has a particular theme. You don't have to spend a fortune on these perks (or even anything at all), but simply putting them into place can create an amazing source of excitement. Think of new ways to keep the work place exciting for an easy way to boost morale. Believe it or not, your surroundings can play a huge part on your mood. Music, furniture, room setup, and more, can all be adjusted to promote happy moods. Work with a designer or simply get to Googling about what type of room arrangements can make you happier, even if it's subconsciously. A happy boss will be the leader of happy employees. Just by seeing that you, the man or woman in charge, is pumped to be at work (and rocking it in the process), will encourage them to do the same. Without even realizing it, it's likely that your employees will become perkier and more energetic, just through daily exposure to your smiling self. The power of positivity is a great thing. 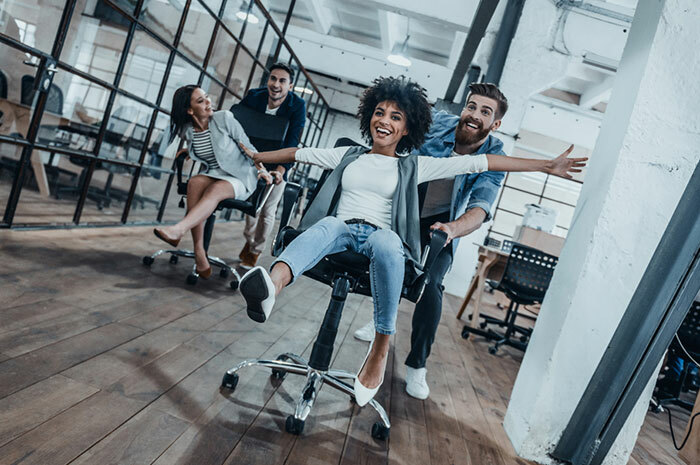 It's been proven that workers who are in a better mood can work more efficiently and get better and bigger tasks accomplished. That means more success (and more money) for your business, simply due to attitude. Start encouraging better moods today for instant way to improve your franchise, and without spending a fortune on that process.